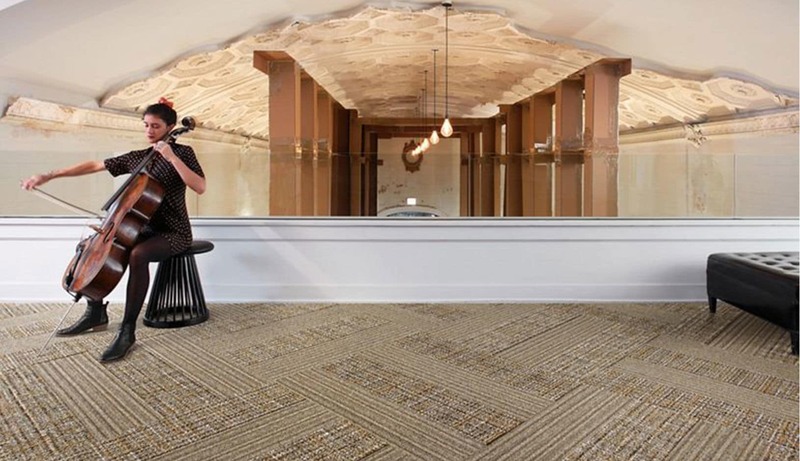 Over twenty years ago, a little known carpet tile company called Interface embarked on its plush path to sustainability. Its destination was the peak of a Mount of Sustainability “higher than Everest”… which they called Mission Zero. The aim was to “do no harm” and everyone thought they were crazy. Through vowing to become “the first fully sustainable industrial enterprise, anywhere,” Interface went on to became the world’s largest global manufacturer of modular flooring, proving that high profitability could go hand in hand with zero waste. This pledge to the environment might not seem like big news now, but back in 1994 it was. The late, great founder Ray Anderson became known as one of the nation’s leading environmentalists, devoting his career to making sustainability look elegant-when-woven. His advanced thinking earned him the rock n’ roll titles of ‘environmental vandal’ and ‘captain of industrial capitalism’, making the people cutting floors into squares perceived as anything but square. As most carpets are synthetic, using petrochemicals, Anderson’s vision to “cut the umbilical cord with oil”, which is traditionally used in nylon yarn, was considered outrageous. He also made sure his factories and offices used power from renewable sources and consumed their own waste as raw material for new textiles. This ‘cyclic capitalism’ provided giant steps toward zero, which means Interface could erase their environmental impact ahead of its 2020 schedule. But now being neutral is not enough. Under the leadership of COO Jay Gould and Chief Sustainability Officer Erin Meezan, they want to go beyond reducing negative impact to creating a positive one… to reverse global warming. They are calling this Climate Take Back. Their ambitious challenge of extracting carbon from the atmosphere, where it’s contributing to global warming, and bringing it home is getting the same reaction that Mission Zero did in the ‘90s – which is fine with Interface. They want to get back to when they started out in sustainability and everyone thought their big, audacious goal was too big and too audacious. If it was any other company you might agree, but Interface knows they cannot achieve this alone, so are pulling suppliers and customers into their orbit and encouraging others by setting new benchmarks. They plan to create factories like forests, with supply chains that benefit all life, lowering greenhouse gas concentrations in the atmosphere to reduce atmospheric gases and reverse rising global temperatures. In the words of Anderson, “Every person, every organisation, can have a positive impact – can be “a rainbow in a cloudy sky”. Tags: Business, Carbon, Clean energy, Clean water, Environment, Plastic waste, Pollution, Recycling, Renewable energy.